Over 10 Million Sold Worldwide! 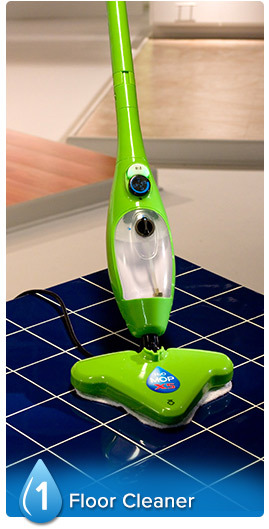 For any hard floor, the H2O Mop® X5™ 200° steam cleaning breaks down and loosens the dirt. In the same pass, the super absorbent microfiber attachments lift the dirt and lock it in – sweeping, mopping and polishing your floor all at once! For carpets and rugs, use the carpet glider attachment to help clean and refresh all your rugs and carpets – saving you hundreds on carpet cleaners and without using any harmfull chemicals. 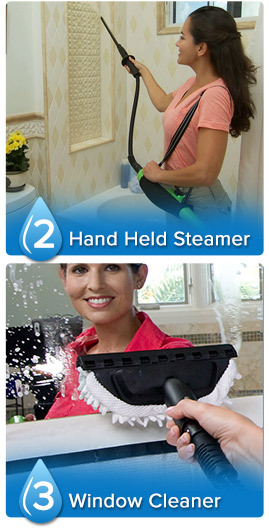 Whatever the surface, the H2O Mop® X5™ will steam it clean! 1. Floor Cleaner - Works On Any Floor Type! For a streak free shine on sealed wood floors. Steam set in between for tile, grout, ceramic and more! 3. Window Cleaner - Cleans Virtually Any Surface in Seconds! Without using any harmful chemicals, have spotless, streak-free cleaning for all glass surfaces, and clean super tough stains on sinks, stove tops, and even inside ovens! 4. 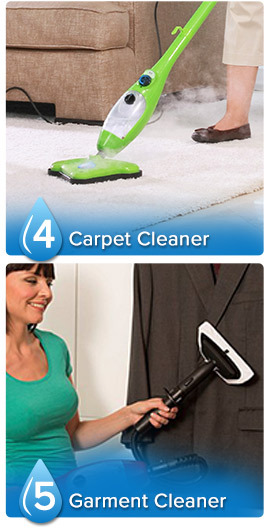 Carpet Cleaner - The innovative Carpet Glider brings carpets and rugs back to life. Use it to remove stains, refresh, revive, and deodorize. 5. Garment Steamer - Say Goodbye to Ironing! With the Garment Steamer attachment, wrinkles fall out, creases melt away and your garments will be fresh and ready to wear. Light Weight and Agile Cleaning for the Whole House! 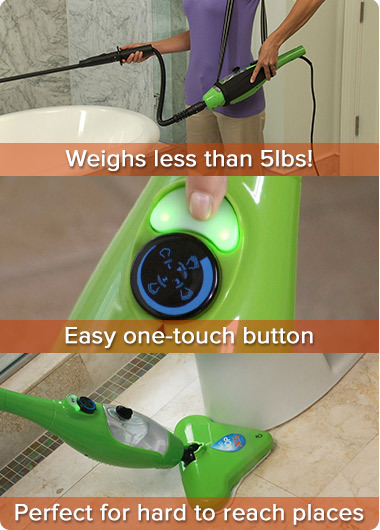 The Ultimate 5-in-1 Steam Cleaner! 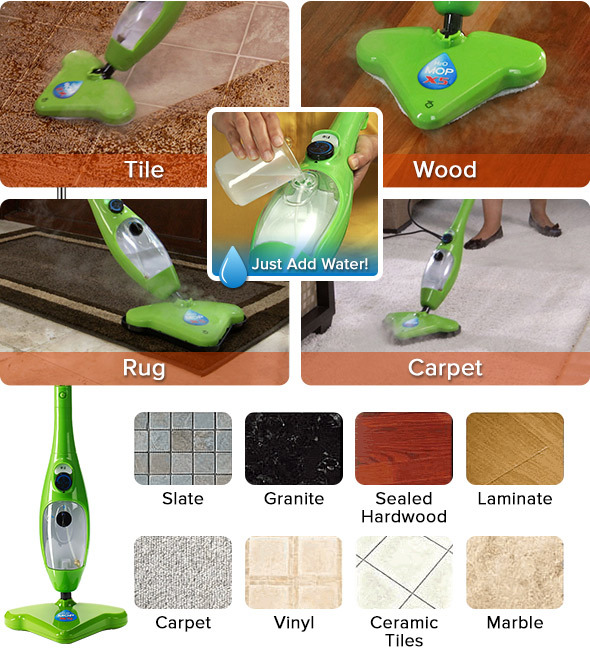 *Offer Details: Special TV Offer H2O Mop™ X5 for one easy payment of $119.85 with free shipping or 3 payments of $39.95 charged in 30 day intervals to the payment account you provide today. Usually Ships in 1 Business Day. H2O Mop® X5™ and related logos and variations are trademarks or registered trademarks, in Canada and/or other countries, of Thane IP Limited and/or its affiliated companies. *Always check your floor manufacturer’s cleaning instructions before using this product. **Controlled lab testing has shown that when applied for up to 15 seconds, the H2O X5 Steam Cleaner can kill between 82% to 99.9% of certain bacteria and viruses. Efficacy varies according to surface tested. † Over 10 million "H2O" series steam cleaners have been sold in over 80 countries.